The Northeast is well-known for the beauty of its changing seasons — people travel from all over the country just to see the leaves change in New England. For hikers, the temperate climate means you get the best of both worlds — evergreen forests in the summer and snow capped mountains in the winter. Here are five mountains to add to your must-see list if you’re planning a trip up north. Mount Washington State Park, NH Mount Washington State Park sits atop the highest peak in the entire Northeast, and is surrounded by the vast White Mountain National Forest. On a clear day, you can see New York, Vermont, Maine and even Quebec from the summit’s observatory. 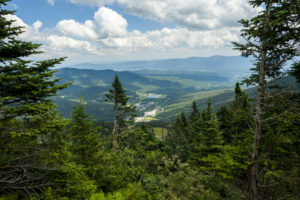 Getting there will be quite the trek, though — the Appalachian Mountain Club rates this hike as “strenuous.” Pro tip: If you’re into the views, but not the hike, there is also the option of driving to the top of the mountain. Acadia National Park, ME Acadia National Park is perfect for when you can’t decide between a beach vacation and a woodsy nature retreat. 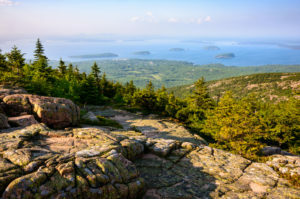 Spread out amongst various islands off the coast of Maine, Acadia National Park boasts beautiful granite peaks, picturesque views and pristine bike trails. There are hiking paths here for all levels of experience, from the 1 mile Wonderland Trail to the steep, 4.6 mile Sargent Mountain hike through the ravines. Cascade Mountain, NY Cascade Mountain is one of the most accessible and popular trails of the 46 Adirondack High Peaks. At just under 5 miles round trip, this is a great choice for beginner hikers who want to take it easy, but don’t want to miss out on a great view. From the peak, you can see Lake Champlain and New York’s Green Mountains. Mount Mansfield, VT Mount Mansfield is the highest (and most popular) mountain in Vermont. Once you get to the base, there are various trails you can hike to get to the summit. Some are more scenic, while others forge a direct path up the mountain. This is definitely a hike for the spring, summer, or fall — but winters at the top of the mountain can get pretty harsh! Bear Meadows, PA Bear Meadows is the perfect trail for beginners — it’s a quick, 3 mile hike on flat terrain around one of the biggest freshwater bogs in the Northeast. As an added bonus, in July and August, you can pick blueberries along the edges of the trail. Yum!